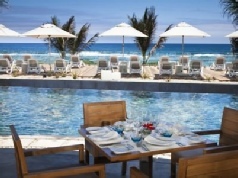 The Radisson Blu Poste Lafayette Resort & Spa Mauritius is a contemporary interpretation of the island’s architectural heritage, seamlessly blending in with the lush surroundings and flanked by a pristine beach with its own sparkling lagoon to one side and a leaf-green mountain to the other. Located on Poste Lafayette’s costal road, on the scenic east coast, the resort is ideally placed to explore all the charms of the island. Adults only. Situated on a pristine beach in Poste Lafayette area, the resort is a one-hour drive away from the island’s international airport. Set amidst manicured gardens and luxuriant surroundings, the resort's 100 rooms feature a minimalist design, blending colours with fabrics that mirror the sun-filled landscapes and azure waters. Standard rooms provide guests with impressive views of the nearby mountains and include en-suite bathroom facilities. In-room comforts comprise individually controlled air-conditioning, flat screen TV with international TV channels, mini-bar, coffee making facilities, in-room safe, IDD telephone line, and wireless internet access. Superior Garden rooms offer guests views of the resort’s well maintained gardens, and include access to your own private balcony/terrace. There is also an en-suite bathroom. Superior Ocean rooms look out across the ocean and include access to a private balcony/terrace to take full advantage of the view. En-suite facilities are also included. With a large free-form swimming pool overlooking the ocean, a host of facilities and activities on offer as well as an extensive stretch of fine sands spilling into crystal clear waters, the resort has something for everyone. Water sport enthusiasts will adore the resort’s turquoise blue lagoon offering snorkelling opportunities and water sports. A haven dedicated to well-being and serenity, the spa offers an extensive range of therapeutic treatments including Ayurvedic applications and holistic experiences ranging from simple aromatherapy and reflexology to spa journeys where you are utterly pampered. Dining options include Café Nautilus, a thatched-roof open-air restaurant serving international themed buffets for breakfast, lunch and dinner with the emphasis on locally produced food and in season ingredients, plus Aqua 180 Degrees, a convivial restaurant and bar that combines tasty comfort food, tapas, burgers and freshly baked pizzas, with the convenience of being steps away from the crystal clear waters. Located on the beachfront, Phi offers a creative a la carte menu inspired by Italian cuisine. Every dish is a delight to the palate and the eyes. 2019 package holidays to the Radisson Blu Poste Lafayette Resort & Spa Mauritius Prices are per person based on two sharing.